How Much Winter Riding Can You Bear? 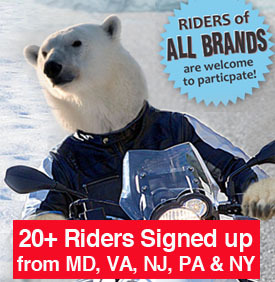 This winter Bob’s BMW Motorcycles in Jessup, MD is hosting its first annual High Mileage Polar Bear Challenge, proudly sponsored by Gerbing and Rev’It! All brand riders are welcome and encouraged to participate. This High Mileage Polar Bear Challenge is a cool and fun opportunity to do what we ALL enjoy best…ride…it’s that simple! With over 20 registered riders already, coming from states all around, we are looking forward to a winter of friendly competition. We will track miles on facebook and in our monthly newsletters so even those of you across the country can enjoy following along and cheer on your fellow riders. The first round of the Challenge begins this month. Every month one male and one female rider will win prizes donated by the sponsors of the challenge, Gerbing Heated Gear and Rev’it! Plus, at the end of the four months, the male and female rider with the highest cumulative miles will be our Grand Prize Winners. 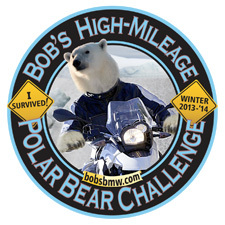 Winners will receive great winter riding gear provided by our gracious sponsors and all participants will get bragging rights among fellow riders and an “I Survived Bob’s High Mileage Polar Bear Challenge 2013-2014” bike decal! Registration must be done in person at Bob’s Service Department. Registration is open during regular service department business hours, Tuesday-Friday 9am-6pm and Saturday 9am-4pm (see below for specific registration and mileage check-in dates). Each motorcycle will receive a FREE winter safety inspection by a certified technician at the time of registration. The idea is to have fun and enjoy a friendly competition but Bob’s want to do what it can to ensure everyone is safe in the process. To accommodate unpredictable winter weather and personal schedules, each round’s registration will remain open throughout most of the month but keep in mind the sooner you register your starting mileage, the better chances you have in winning! If by any chance you are not able to check in during the check in dates listed below, you are asked to purchase a newspaper, hold it next to your odometer and email that image to hanna.creekmore@bobsbmw.com. Please note this method of check-in will not be accepted on a regular basis. You can participate in as many rounds as you like. You do NOT have to participate in every round but again, the more miles you officially check-in at Bob’s, the better your chances are of winning some great winter riding gear! A special note to out-of state participants: We want you to join in the fun and we understand the challenge that the added distance from us creates for you (or you could look at it as a benefit! ); however, we still require registration to be completed in person. If you are unable to ride to Bob’s for the monthly check-in’s, you can still participate in the cumulative portion of the challenge as well as at least one monthly round (as mentioned above, checking-in via email is accepted just not on a regular basis). To qualify for the cumulative, you must register in person and then return for the final check in; at which point you will receive your “I Survived” bike decal!